Smooth, eggy custards are sublime comfort food. These orange slices drizzled in stem ginger syrup are a refreshing foil to the custard's richness. Preheat the oven to 140°C, gas mark 1. Place the milk, cream, ginger and 50g of the sugar in a saucepan over a low heat and bring to just below boiling point. Take off the heat and allow the ginger to infuse for 20 minutes. Meanwhile, prepare a bain marie: place a roasting tray one-third-full of warm water on the oven's middle shelf. Peel thin strips of orange zest and cut into long strips. Set aside. Cut away the orange skin and white pith, and slice the flesh. Mix with the stem ginger and syrup. Set aside. In a separate bowl, whisk the egg and yolks with the remaining sugar. Pour on the infused milk and stir until blended. Strain through a sieve and discard the ginger, then divide between 6 x 175ml ramekins. Cook in the bain marie for 35-40 minutes until the custards lose their wobble. Leave to firm for 5 minutes, and scatter with zest. Serve with the sliced oranges in stem ginger. 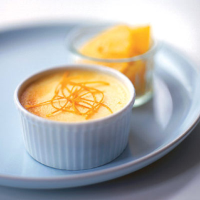 Custards all work well with Sauternes-style dessert whites.